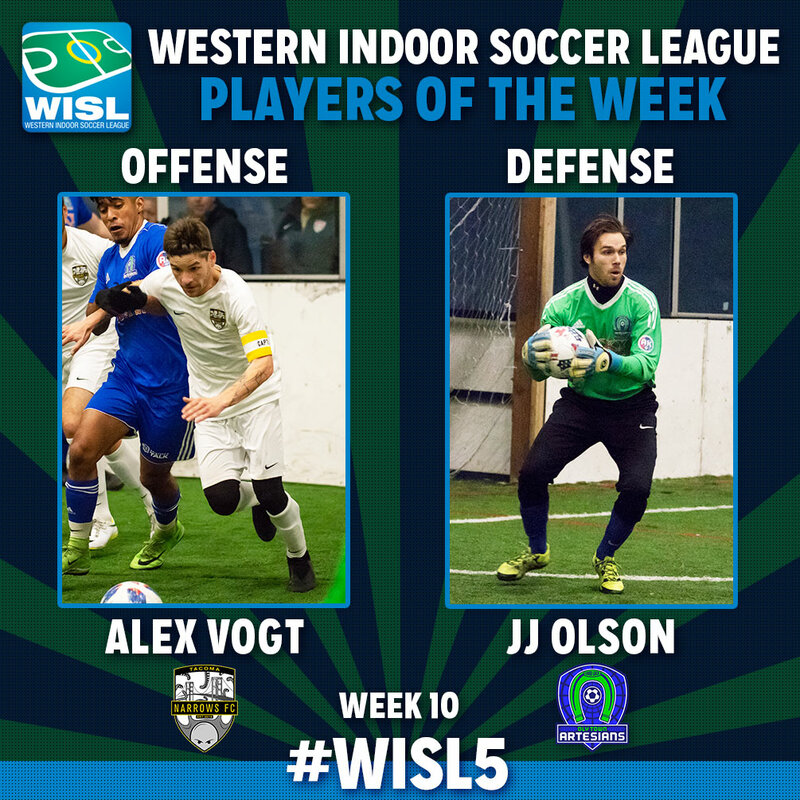 Western Indoor Soccer League club operators and coaches have voted Tacoma Narrows forward Alex Vogt and Oly Town goalkeeper JJ Olson as their Offensive and Defensive Players Of The Week for week 10, the final week in the regular season. Needing a win to advance to the playoffs, first year club Tacoma Narrows FC found themselves down 5-1 and 7-4 against the Oly-Pen Force, who also needed a win to advance. But Narrows fought back and, thanks to an Alex Vogt goal, took a 9-8 lead with 8:46 left. The Force tied the game, 9-9, but it was Vogt’s second goal with 2:54 left that proved to be the game winner and rocketed Tacoma up from fifth place to third to finish the regular season. Vogt also chipped in three assists in the game. With his brace in what was essentially a playoff game, Vogt finished the season with seven goals. He was nominated for Offensive POTW for his hat trick in the season opener against Oly Town. Now Vogt and his Narrows squad head up to Bellingham to take on the Hammers in their first playoff game in the WISL. Other Offensive POTW nominees included the Stars Reserves duo of Nate Ford and JJ Schmeck, who each scored a hat trick in an 11-4 win that was deceptively close until Tacoma exploded late in the game. Oly-Pen’s Jaisen Zurfluh also scored a hat trick and earned his second nomination in as many weeks thanks to five goals over that span. Two Tacoma defenders earned Defensive POTW nominations. The Stars Reserves’ Adrian Correa scored once and added four blocks and killed two power plays as a member of their man down line. And Narrows’ Kasey Sidor scored twice from the back line and was an important defensive part of setting them up for their big win.